Part time Oracle artist Anna-Maria Dickinson will have a show at the Adobe Barn Gallery at the Triangle L Ranch. The show, Paintings: Anna-Maria Dickinson opens on Friday March 17, 2017 and will run to March 18, two days only. 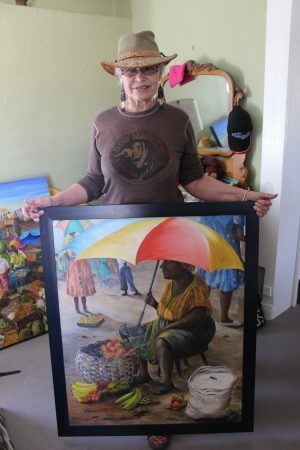 The show will include old and new oil paintings which reflect her early adult life growing up in the Caribbean and scenes from Canada where she now lives. The opening reception will include food, drink and live music. The reception is from 5 to 9 p.m. Saturday the show is on display from 10 a.m. to 3 p.m. This will also be a going away party for Anna-Maria as she will be returning to her home in Canada. Anna-Maria divides her time and artistic life between Flesherton, Ontario, Canada and Oracle, Arizona. She is part owner of a gallery in Flesherton and her art is displayed at the Triangle L Ranch in Oracle. She spends her winters in Oracle where she says, “I am home, I love it here. 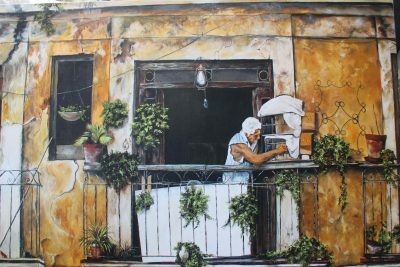 There is so much inspiration around this place.” You can learn more about Anna-Maria and her art by visiting bit.ly/2nlLcfQ.